The privacy of our competitors is important to us, so please let us explain how and where your data supplied gets used.When you enter our events, we collect information from you that we, as organisers, need to be able to run the race.Your email address will stay with us, and we won’t either publish it or sell it on to anyone else. 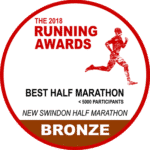 You will get emails from us as Swindon Half Marathon and 113 Events from time to time with important information on our races, but you can unsubscribe to these at any point if you feel you are getting too many or they’re just not relevant.Your information will only be shared with our Timing System partners, UK Athletics, Photography partners, medal ITAB providers as well as your medical information and emergency contact information going to our first aid and medical partners.The only information that you will provide to us or we collect, that we will publish, is your name, age group, club/team name and your race time, and we reserve the right to be able to use any images of competitors we collect during the event.We use a third party entry system, who have secure servers (SSL) on which they take and process your card details when you enter the events online. Only the entry system provider gets this information, and that doesn’t come to us as organisers.In Summary, we use your information lawfully, and in accordance with the Data Protection act, and will not share or publish your information publically other than explained above, or rent/sell your email address to any third parties. The homeopathic ingredients in buy celexa fedex Promaxol are the key to your..